Phosphatidylethanolamines are a class of phospholipids found in biological membranes. They are synthesized by the addition of cytidine diphosphate-ethanolamine to diglycerides, releasing cytidine monophosphate. S-Adenosyl methionine can subsequently methylate the amine of phosphatidylethanolamines to yield phosphatidylcholines. It can mainly be found in the inner (cytoplasmic) leaflet of the lipid bilayer. Where phosphatidylcholine is the principal phospholipid in animals, phosphatidylethanolamine is the principal one in bacteria. One of the primary roles for phosphatidylethanolamine in bacterial membranes is to spread out the negative charge caused by anionic membrane phospholipids. In the bacterium E. coli, phosphatidylethanolamine play a role in supporting lactose permeases active transport of lactose into the cell, and may play a role in other transport systems as well. 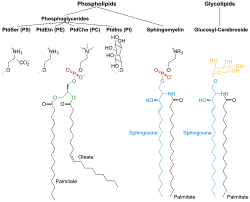 Phosphatidylethanolamine plays a role in the assembly of lactose permease and other membrane proteins. It acts as a 'chaperone' to help the membrane proteins correctly fold their tertiary structures so that they can function properly. When phosphatidylethanolamine is not present, the transport proteins have incorrect tertiary structures and do not function correctly. ^ Wellner, Niels; Diep, Thi Ai; Janfelt, Christian; Hansen, Harald Severin (2012). "N-acylation of phosphatidylethanolamine and its biological functions in mammals". Biochimica et Biophysica Acta. 1831 (3): 652–62. doi:10.1016/j.bbalip.2012.08.019. PMID 23000428. ^ Mishkind, Michael (2000). "Phosphatidylethanolamine – in a pinch". Trends in Cell Biology. 10 (9): 368. doi:10.1016/S0962-8924(00)01826-2. ^ a b Vance, Jean E.; Tasseva, Guergana (2012). "Formation and function of phosphatidylserine and phosphatidylethanolamine in mammalian cells". Biochimica et Biophysica Acta. 1831 (3): 543–54. doi:10.1016/j.bbalip.2012.08.016. PMID 22960354. ^ Emoto, K.; Kobayashi, T; Yamaji, A; Aizawa, H; Yahara, I; Inoue, K; Umeda, M (1996). "Redistribution of phosphatidylethanolamine at the cleavage furrow of dividing cells during cytokinesis". Proceedings of the National Academy of Sciences. 93 (23): 12867–72. Bibcode:1996PNAS...9312867E. doi:10.1073/pnas.93.23.12867. JSTOR 40713. PMC 24012. PMID 8917511. ^ Vance, J. E. (2008). "Thematic Review Series: Glycerolipids. Phosphatidylserine and phosphatidylethanolamine in mammalian cells: Two metabolically related aminophospholipids". The Journal of Lipid Research. 49 (7): 1377–87. doi:10.1194/jlr.R700020-JLR200. PMID 18204094. ^ Deleault, N. R.; Piro, J. R.; Walsh, D. J.; Wang, F.; Ma, J.; Geoghegan, J. C.; Supattapone, S. (2012). "Isolation of phosphatidylethanolamine as a solitary cofactor for prion formation in the absence of nucleic acids". Proceedings of the National Academy of Sciences. 109 (22): 8546–51. Bibcode:2012PNAS..109.8546D. doi:10.1073/pnas.1204498109. PMC 3365173. PMID 22586108. ^ Majumder, R.; Liang, X.; Quinn-Allen, M. A.; Kane, W. H.; Lentz, B. R. (2011). "Modulation of Prothrombinase Assembly and Activity by Phosphatidylethanolamine". Journal of Biological Chemistry. 286 (41): 35535–42. doi:10.1074/jbc.M111.260141. PMC 3195639. PMID 21859710. ^ Isidro, F. (2014). "Cannabinoids for treatment of Alzheimer's disease: moving toward the clinic". Frontiers in Pharmacology. 5: 37. doi:10.3389/fphar.2014.00037. PMC 3942876. PMID 24634659. ^ Christie, W.W. (April 16, 2012). "Phosphatidylethanolamine and Related Lipids". The AOCS Lipid Library. Archived from the original on August 21, 2012. Retrieved September 3, 2012. ^ Gbaguidi, B.; Hakizimana, P.; Vandenbussche, G.; Ruysschaert, J.-M. (2007). "Conformational changes in a bacterial multidrug transporter are phosphatidylethanolamine-dependent". Cellular and Molecular Life Sciences. 64 (12): 1571–82. doi:10.1007/s00018-007-7031-0. PMID 17530171. ^ Kelly, Karen (July 28, 2011). 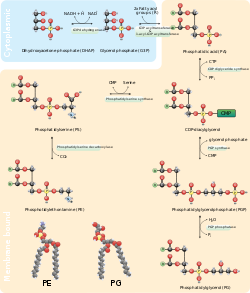 "Phospholipid Biosynthesis". The AOCS Lipid Library. Retrieved September 3, 2012. ^ a b Oak, Jeong-Ho; Nakagawa, Kiyotaka; Miyazawa, Teruo (2002). "UV analysis of Amadori-glycated phosphatidylethanolamine in foods and biological samples". The Journal of Lipid Research. 43 (3): 523–9. PMID 11893788. ^ Oak, Jeong-Ho; Nakagawa, Kiyotaka; Miyazawa, Teruo (2000). "Synthetically prepared Amadori-glycated phosphatidylethanolamine can trigger lipid peroxidation via free radical reactions". FEBS Letters. 481 (1): 26–30. doi:10.1016/S0014-5793(00)01966-9. PMID 10984609. ^ Oak, Jeong-Ho; Nakagawa, Kiyotaka; Oikawa, Shinichi; Miyazawa, Teruo (2003). "Amadori-glycated phosphatidylethanolamine induces angiogenic differentiations in cultured human umbilical vein endothelial cells". FEBS Letters. 555 (2): 419–23. doi:10.1016/S0014-5793(03)01237-7. PMID 14644453. ^ Eitsuka, Takahiro; Nakagawa, Kiyotaka; Ono, Yuichi; Tatewaki, Naoto; Nishida, Hiroshi; Kurata, Tadao; Shoji, Naoki; Miyazawa, Teruo (2012). "Amadori-glycated phosphatidylethanolamine up-regulates telomerase activity in PANC-1 human pancreatic carcinoma cells". FEBS Letters. 586 (16): 2542–7. doi:10.1016/j.febslet.2012.06.027. PMID 22750441. ^ Ariizumi, Ken; Koike, T; Ohara, S; Inomata, Y; Abe, Y; Iijima, K; Imatani, A; Oka, T; Shimosegawa, T (2008). "Incidence of reflux esophagitis and H pylori infection in diabetic patients". World Journal of Gastroenterology. 14 (20): 3212–7. doi:10.3748/wjg.14.3212. PMC 2712855. PMID 18506928.